So often, these days, people go seeking “adventure” except that they spend so much time and money beforehand, ensuring that nothing goes wrong, that by the time the “adventure” happens, it’s no longer and adventure. In light of this, I have long held to the motto, “It’s not an adventure until something goes wrong”. 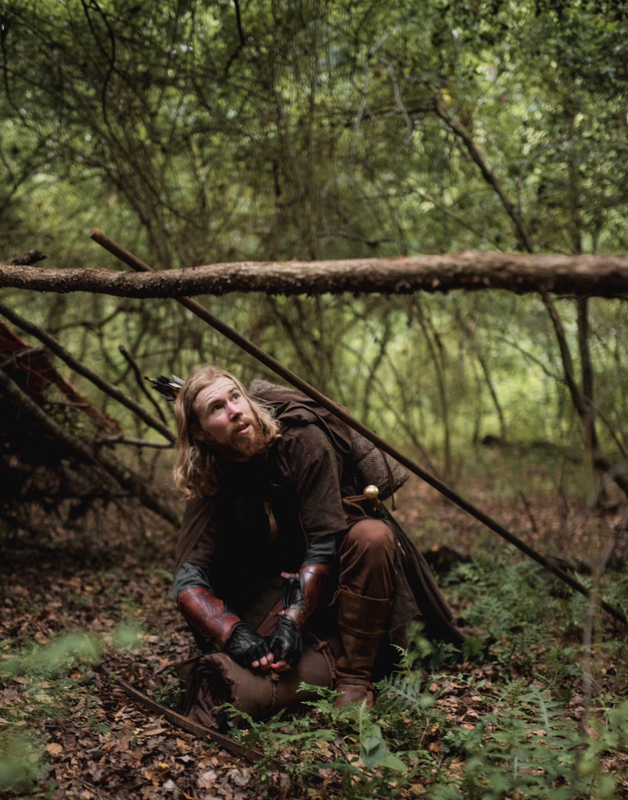 Since I was a child, I have loved stories about the famous outlaws and woodland dwellers of history: people like Robin Hood, William Wallace and Francis Marion who fought oppression from deep within their forest dwellings. 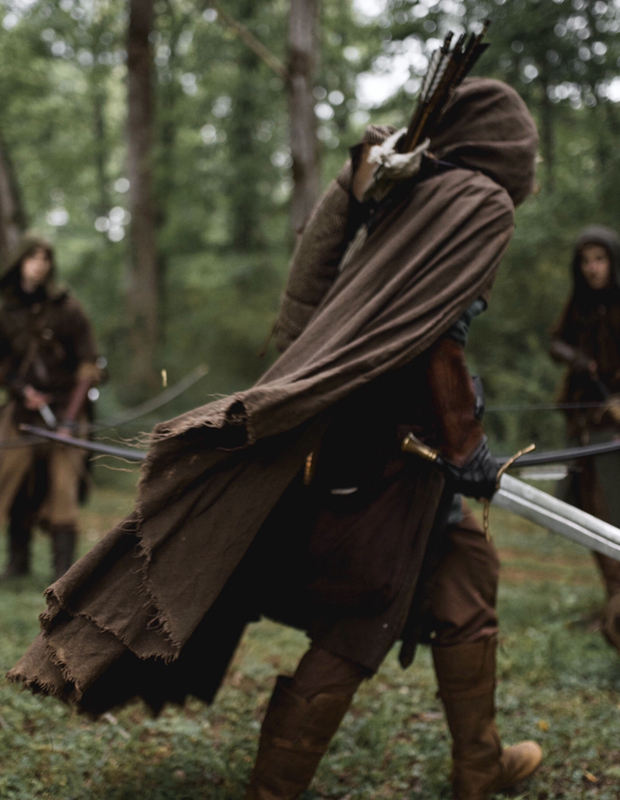 Other characters like Aragorn and Faramir from The Lord of the Rings series had similar roles and are referred to as Rangers. So, when I decided I wanted to start designing costumes, “rangers” was a good first concept to get under my belt. 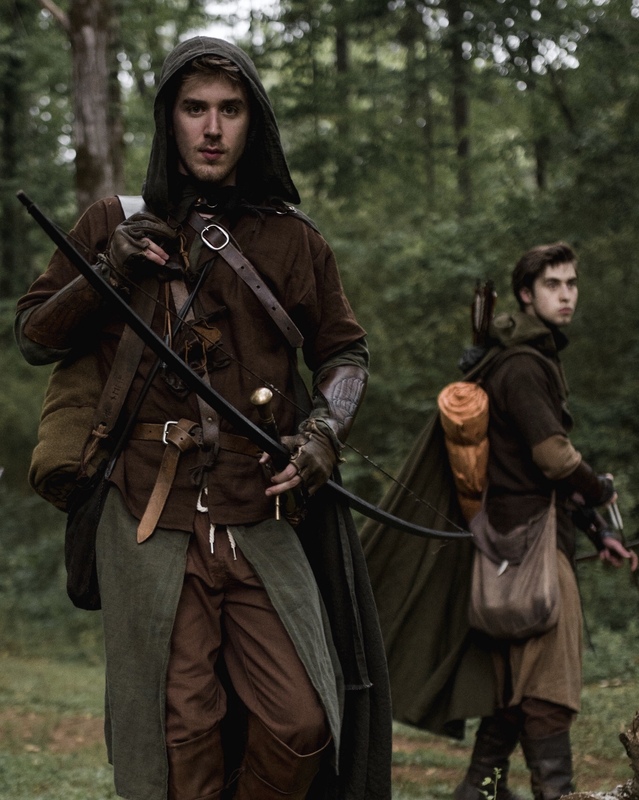 We have had many variations over the years, but with the help of Fabrics-Store, we recently gave our ranger outfits an overhaul. 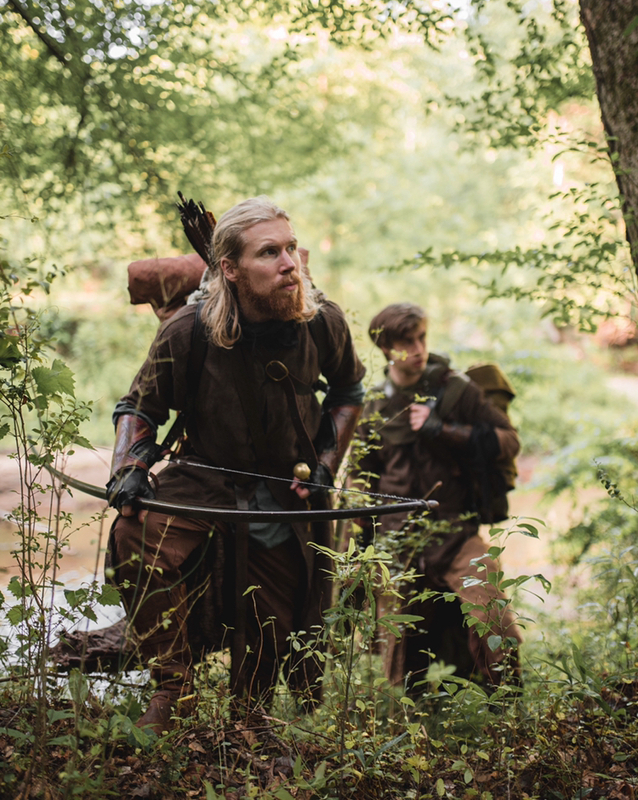 As these are hunters, woodsmen and warriors that live deep in the forest, we wanted to build more practical and less elaborate kits for them to use. Our color palette was simple, the natural greens, browns and tans so often found in the forest. It was a good thing we made these more practical too, because after forecasting clear skies all week, it started raining as soon as we stepped in to the forest. So the “adventure” part started from the beginning. 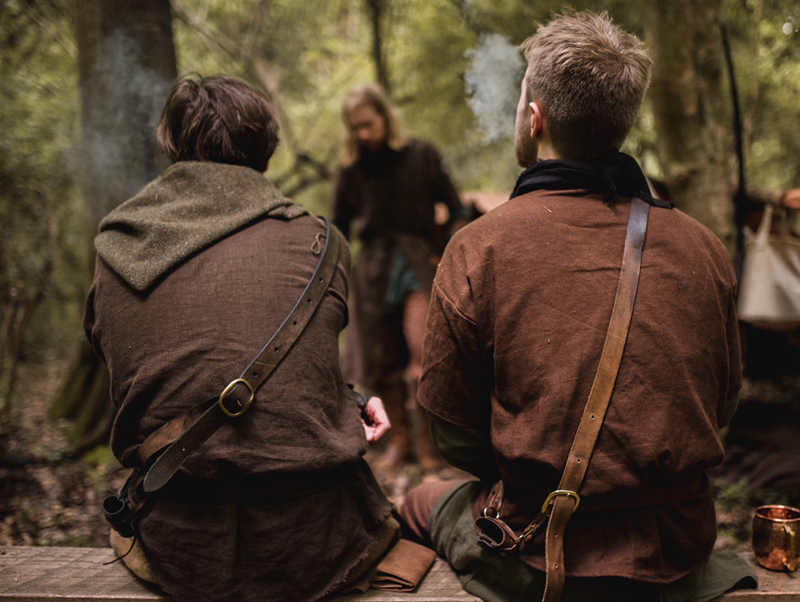 We all played the role of “combat cameraman” at different times during the adventure, but most of the photos were taken by Will and Charles. 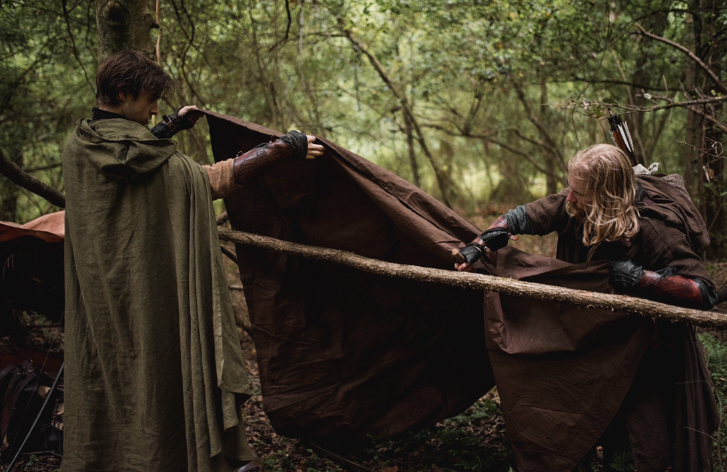 The first and most useful garment in a ranger’s wardrobe is a cloak. Not only are they useful for hiding the hunter in the forest, but they dramatically delay the a thorough soaking when it rains! We made these out of Teak, Olive and Chestnut linen. Rangers top-to bottom: I love using green as the base for our rangers (probably from all that reading about Robin Hood and his men wearing Lincoln Green) so we used Emerald and Olive Green for these two tunics. We used some well washed and softened Root Beer brown (almost black) for the neck wraps/face masks. 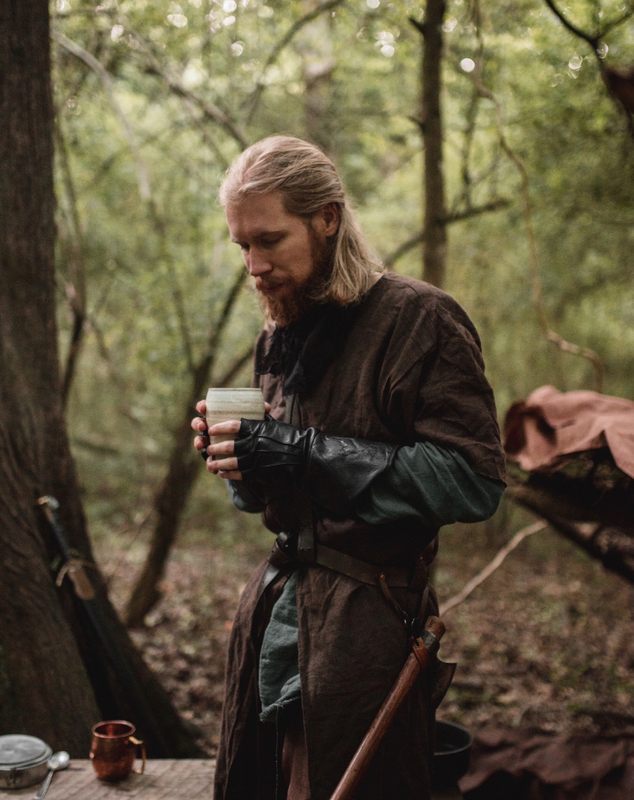 Ginger is another color I like to include in my ranger kits as it breaks up all the dark browns and weathers nicely as seen with this tunic! 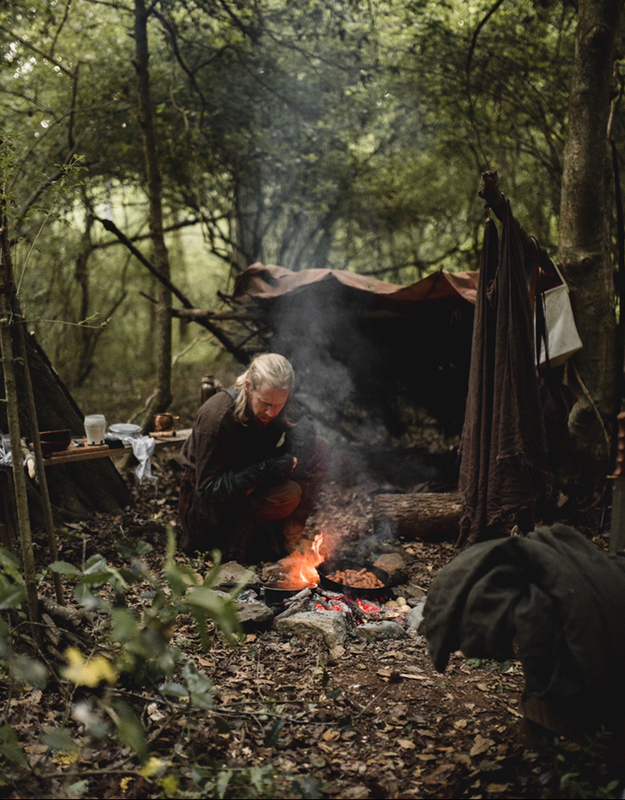 As we were very quickly getting more damp than is really enjoyable in the clearing, we headed for the denser trees and looked for a site to pitch our camp. After an hour of enduring the steady drizzle, we found the perfect spot and hastily unloaded our packs and got canvas over our heads! Of course, as soon as we got our shelters up, the rain stopped, but we now had a camp and it was time to get comfortable! 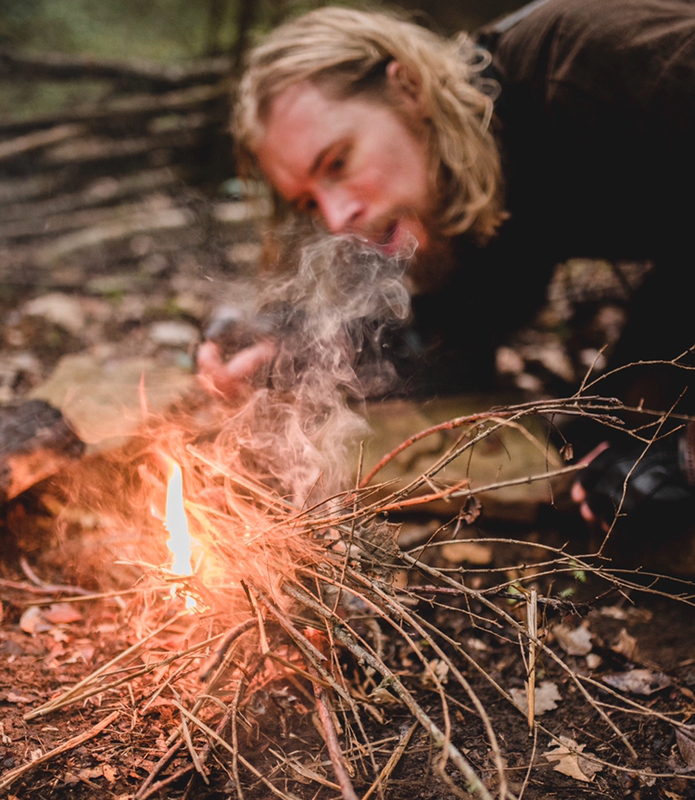 After finding some dry wood and some carefully preserved tinder we brought with us, we quickly had a nice little blaze going. 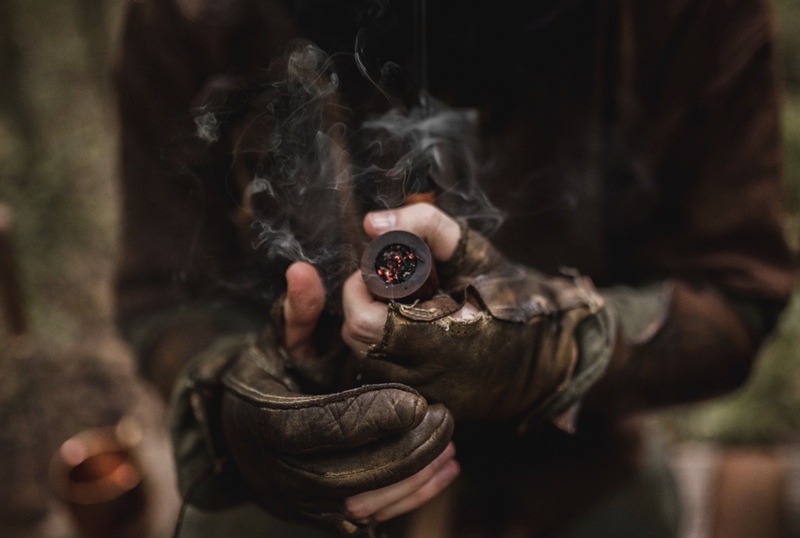 With warmth and shelter provided for, we hung up our wet cloaks to dry and I began cooking supper while the other rangers enjoyed a quiet pipe as darkness began to fall. As part of our re-design, we used linen instead of leather for our rangers vests and coats, here you can see the short-sleeved jackets made of heavyweight Chocolate and Potting Soil brown linen. 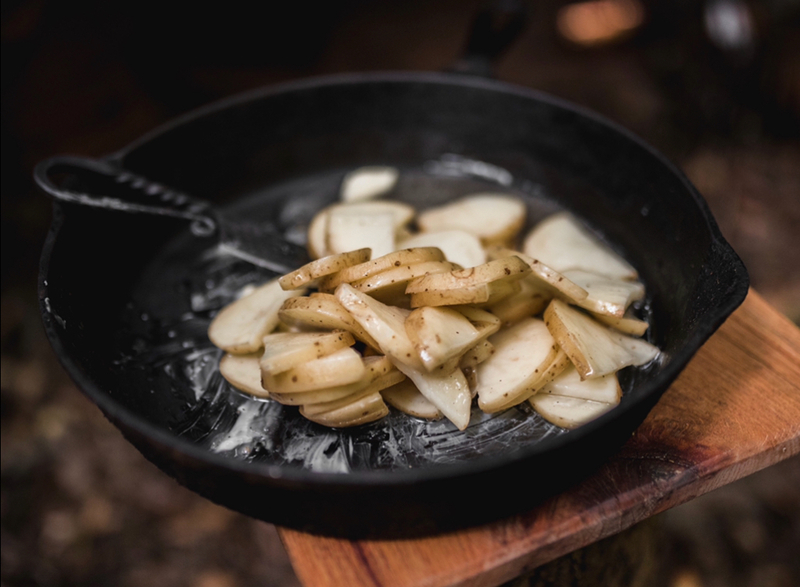 I began with potatoes, onions and a (carefully un-bruised) pepper, then added some delicious beefsteaks (surely purchased from a local farmer at the nearest market town). Our meal was delicious; I’m getting hungry again just writing about it! With our meal eaten, it was cleanup and off to our bedrolls for some much-needed sleep! We did wake in the middle of the night from a donkey’s scream. If you have not heard that sound before, it is terrifying, so much so it was used as the Black Rider’s cry in the Lord of the Rings films! Despite our familiarity with the sound, it did cause us to stay awake for more than a few minutes. Just a little more “adventure” to our night! I rose in the early dawn to re-light the fire as the sleepyheads in the other shelter slept on. Their loss! I got first taste of the morning coffee! (Yes, this is a fantasy world in which the rangers drink coffee because they get grumpy if they don’t). 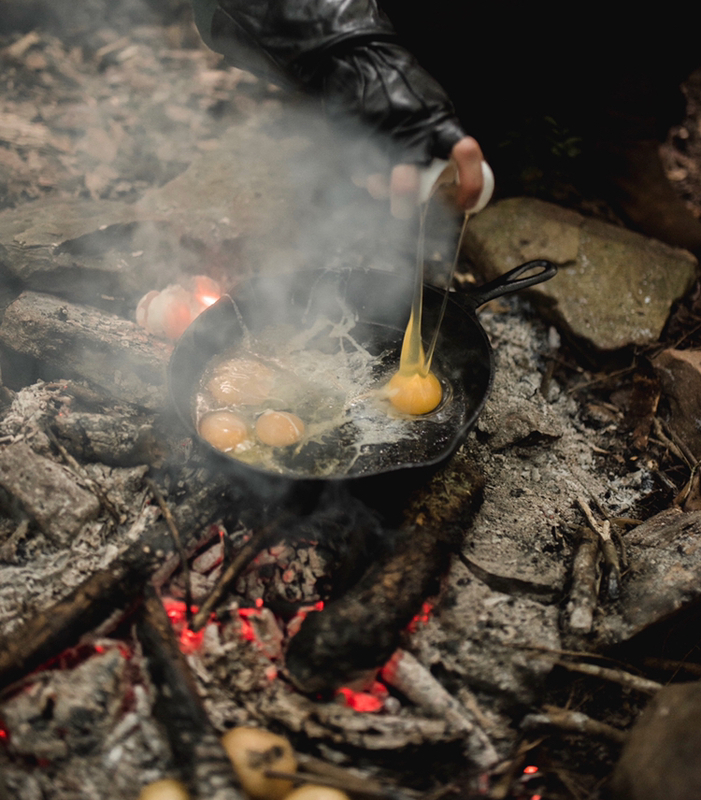 With the coals renewed on the fire, I set to cooking breakfast with a will as the other rangers tore down camp. 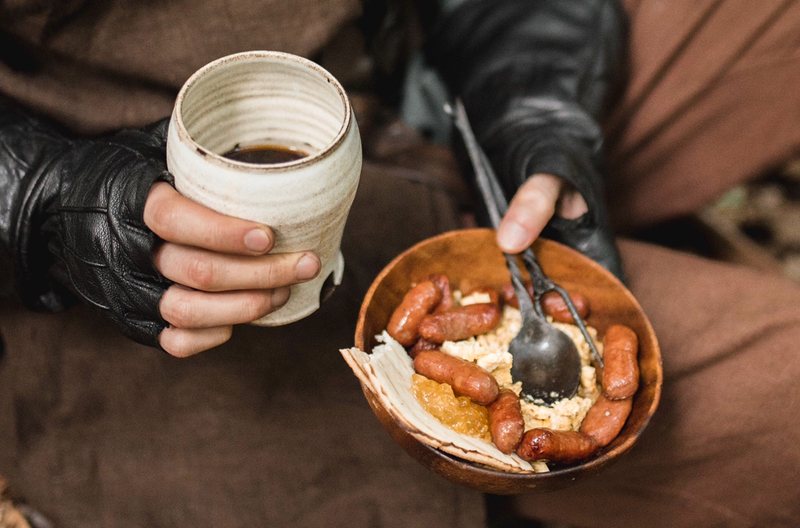 It was potatoes baked in the ashes, eggs, (carefully carried out in a box), sausage and flatbread with jam for breakfast. With full stomachs, dry clothes and aided by caffeine, we packed up and walked out in the beautiful sunlight of a new spring day! That’s it for our adventure! Our new, more practical clothing worked like a dream. 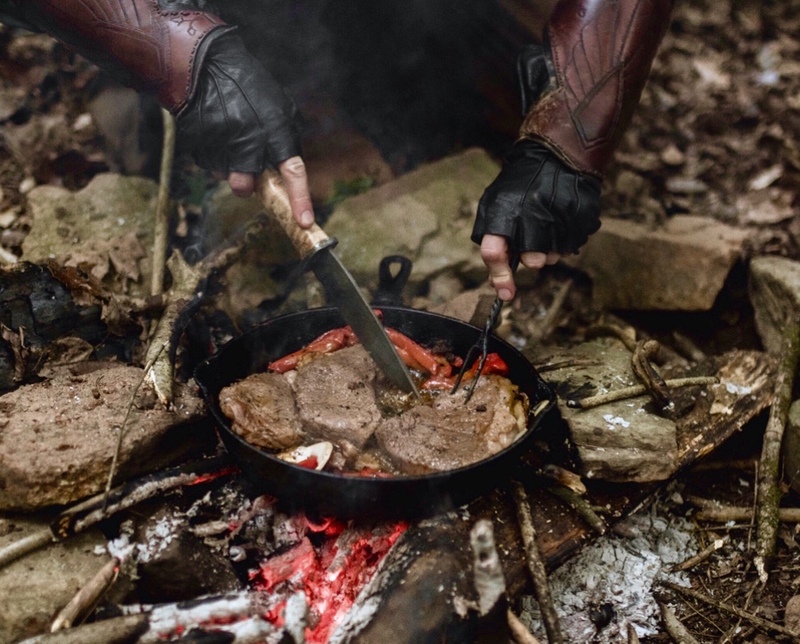 When you have weather, bugs, animals, and potential for roving bands of orcs, having gear that helps and does not hinder you can make the difference in survival (well, at least a more comfortable camping trip). 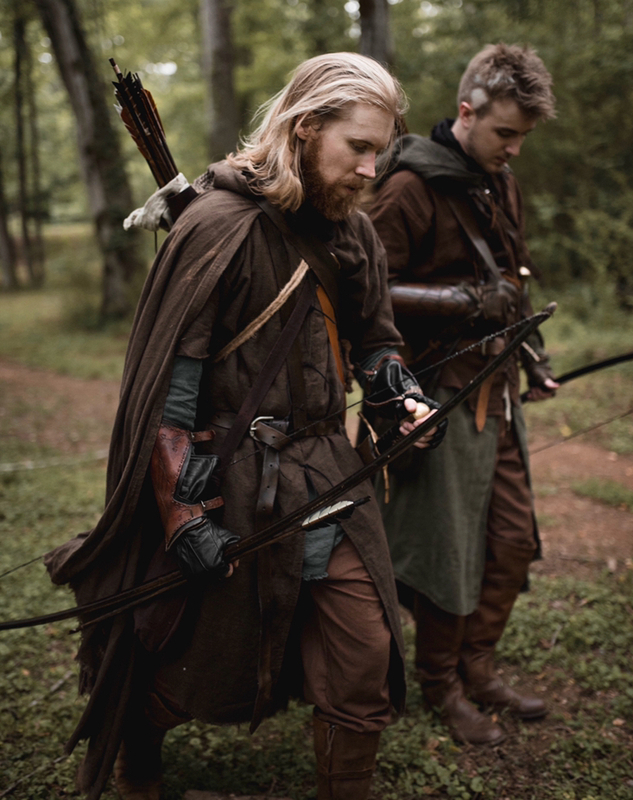 What clothing would you like to make for an “adventure”? Feel Free to let us know how you liked the post and thank you for joining us on our adventure. I love everything about this! Can we look forward to some patterns? also i would like to know where you got the leather pack? and the canvas shelter- bought, or made by you? were the nighttime temps cold or comfortable?- because sleeping in damp clothing might risk hypothermia! 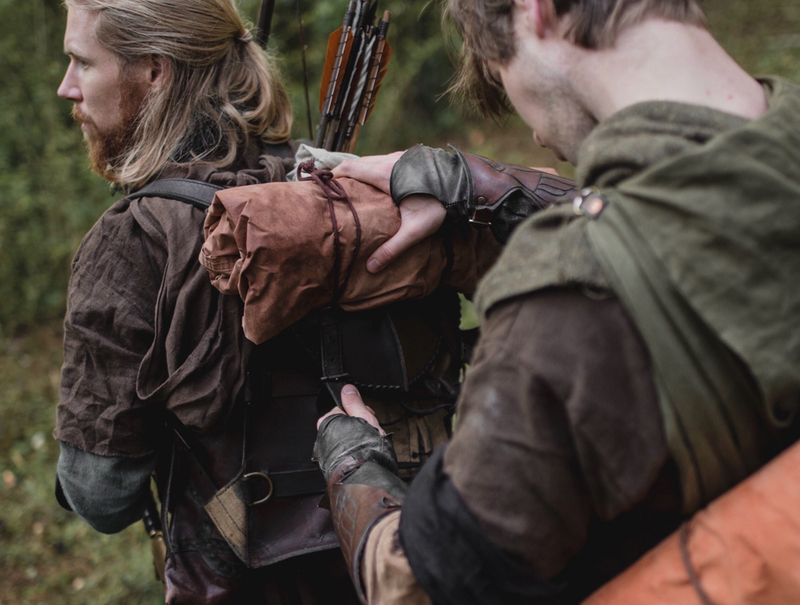 We got the pack from Epic Armoury then modified it to hold the bedrolls, tarps and axes. We made the tarps. They are cotton cloth with a waterproofing treatment. We had wool blankets that kept us nice and warm through the night! (It got down to about 59°). Having had hypothermia before (while in the military), I made sure everyone dried their clothes and gear by the fire before thenwe hit the sack! The photos are awesome! The story was great! I love the colors. Thank you for going outside the box. Kee going guys what a cool adventure ;]?????? Loved your tale of this camping adventure and loved, loved the clothing you guys wore to transport you to another time. 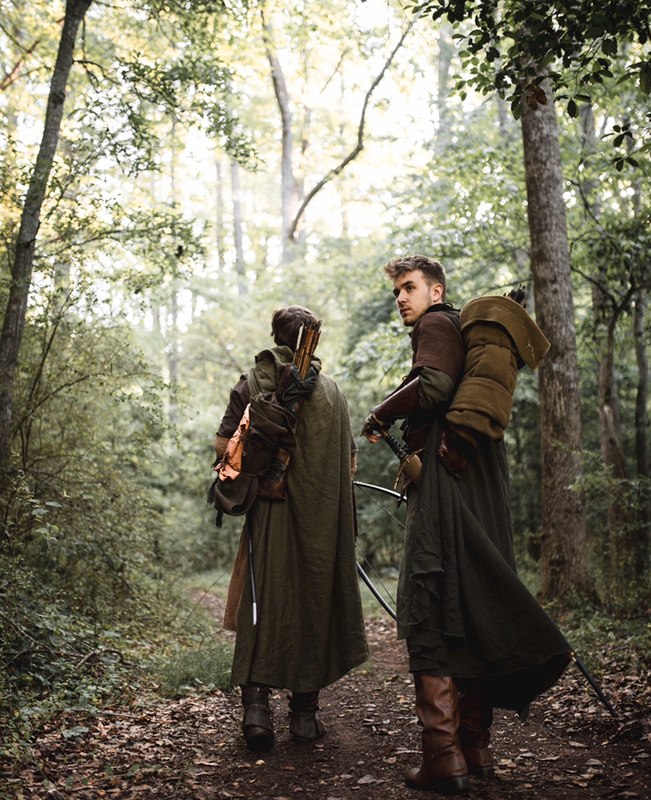 As a little girl in North Carolina, my friend and I played Robin Hood in the local woods – and I got to be Robin Hood. But sadly we didn’t have the capes and hats for our pretend play…just our imaginations. 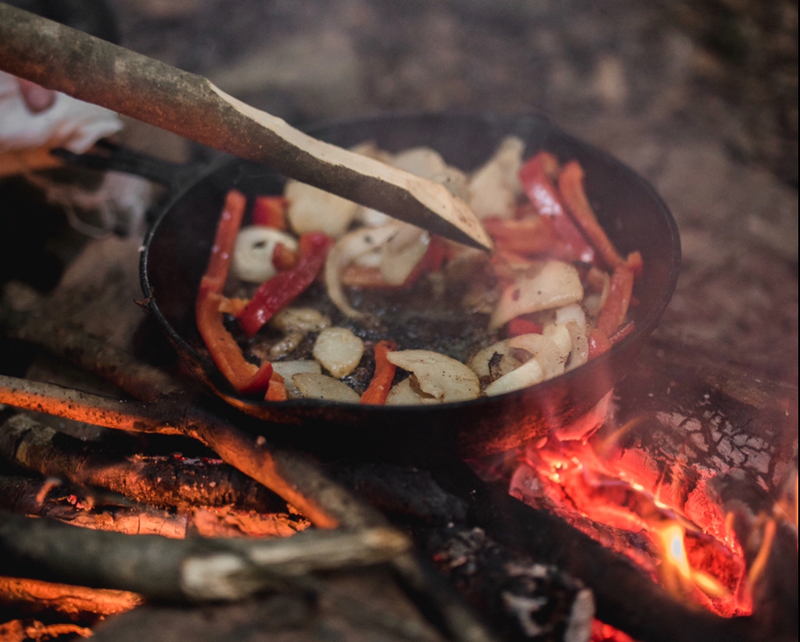 Your campfire meals look hearty enough for any “band of men.” I hope you will post your further adventures and other similar activities of your group. Thanks for a fun read! Thank you for the adventure and the beautiful photography. I’m an Outlander fan, and your pics made me think of Claire and Jamie and their adventures. Gorgeous clothing, gorgeous setting and photographs. 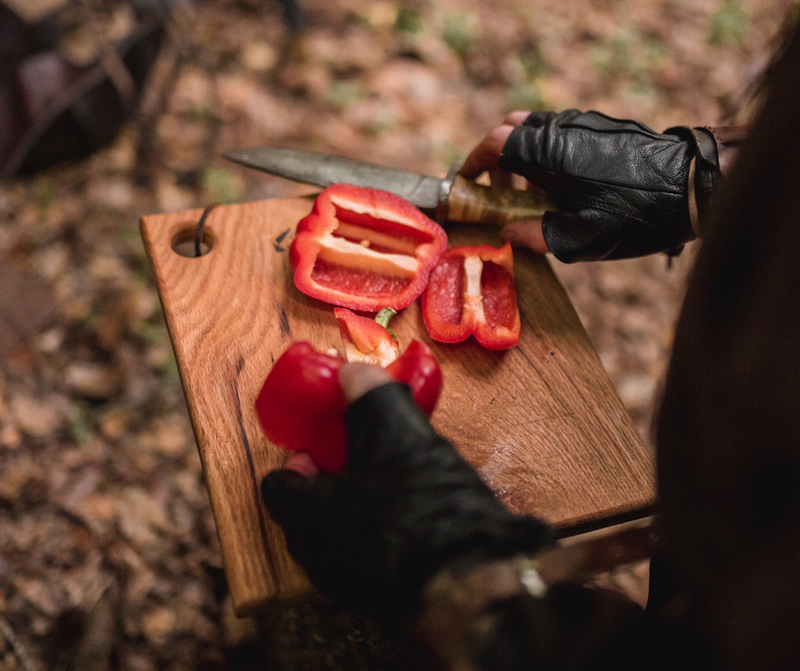 I was transported with you back in time ( everything except for the food – the steaks, the pepper were quite modern! Whither the rootes and potherbs?) Thank you for the adventure. Form a fellow lover of all times romanticized, a good adventure, to be sure! Such a fun read. Now, all that you need to do is add a rescue of some sort and you are ready for prime time! My love of linen runs deep and increases with each piece; this adds to my appreciation. I am so glad to have found Linen-Store.com! So cool! And glad I found this fabric company! Thank you for this great tale. I love the colors and what I can see of the designs. Any chance you can direct us to the patterns used? Unfortuelay they are all our original designs we created for each perso specifically! But they are quite simple garments. Is there anything more amazing than seeing a piece of plain cloth transformed into something spectacular? Seeing that “flat” piece of fabric, once it gets into the creators hands, go from material to a creation is nothing short of miraculous. I will never get enough of seeing what you guys will come up with next…. Fashion Choices For The Bad Guys. The Color That Built A Kingdom.